I hope all of you had a wonderful Thanksgiving (or a wonderful Thursday if you aren't in the US). We left last Sunday to make the drive to Utah to visit my family and made the long drive back home on Saturday. My family is BIG and we had 3 Thanksgiving dinners and I got to see cousins that I haven't seen in ages. On Thanksgiving day we ate dinner with my Mom's extended family and then sat around my aunt's living room for hours just chatting and catching up. I sat under my Maple Leaf Rag quilt with my Grandma while I finished hand quilting the last stitches. It was a very special way to finish the quilt. 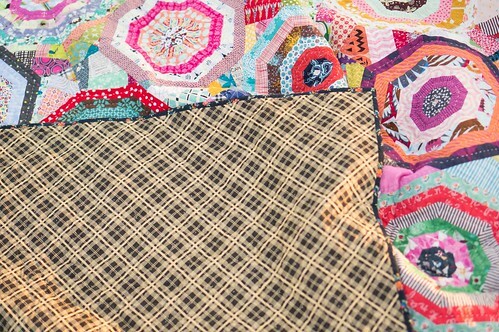 The pattern for this quilt is from the amazing Sarah Fielke's book Material Obsession 2. The pattern asks you to piece the scraps onto muslin, but I didn't want to have the bulk of the muslin in the quilt so I did mine a little differently which I posted a little about in an earlier post. The quilt is hand quilted with perle cotton and this is my first real hand quilting project. I loved the process, even though it took me nine months to finish. You can read more about my thoughts on trying hand quilting here. The backing is Chicopee corduroy which is AMAZING. It is a lot like flannel, but it has a very fine corduroy texture. I would love to see more prints available in corduroy because it makes a very cozy quilt backing and it wasn't at all hard to work with. For the binding I wanted to use a fabric that I hadn't used in the quilt and I wanted it to be a print that I really love so I chose a Shelburne Falls print in the maple colorway. Two of my sisters were kind enough to hold the quilt up for me. 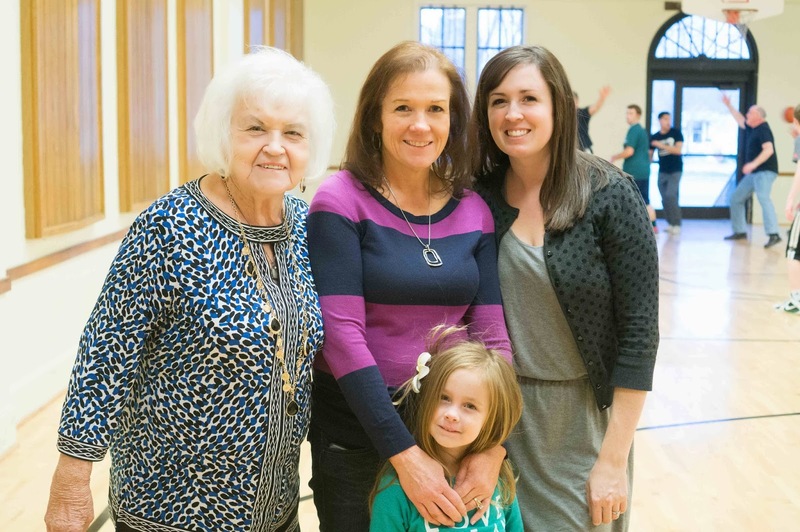 And we were able to get a photo of me with my Mom, Grandma, and daughter. I would definitely recommend this pattern if you have been thinking about making it. It isn't a quick project, but it is so much fun. Wow is it gorgeous!! I totally want to make one now. I love your quilt!! 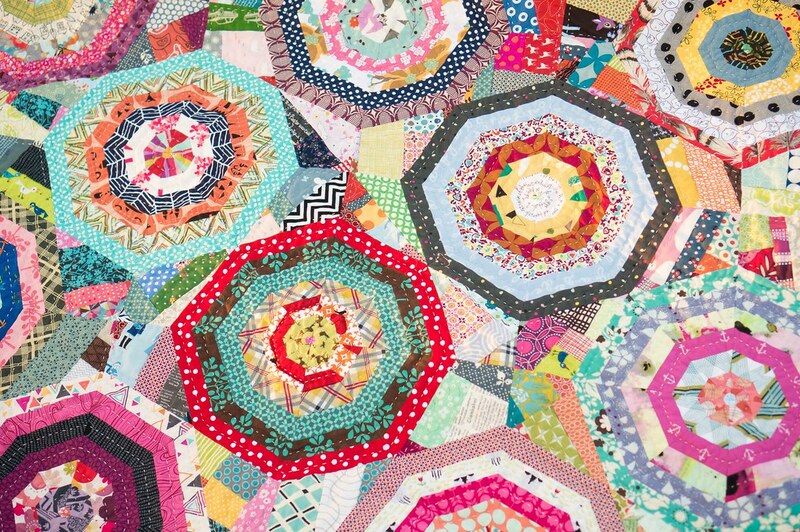 I have the book and have dreamed of making one of these quilts! Maybe I should just make a start! Did you use batting with the corduroy? What a beautiful quilt. I love the pattern, and you've certainly done it justice! The quilt is stunning! Looks like a fantastic scrap buster. OMG. My favourite of your quilts so far. A complete stunner. What an achievement! Beatiful, Erica. And you hand-quilted it? 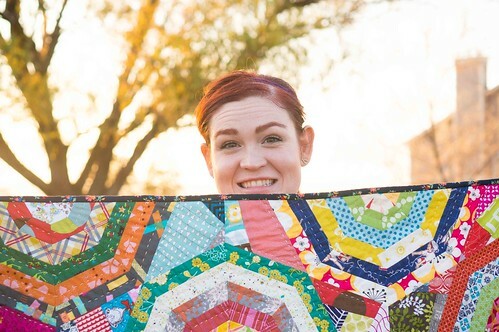 Amazing job on both the quilt and the quilting, and so fun to all the photos of your family. Great memories! Wow! Stunning! I love it! This is beautiful! What an accomplishment! Love the family photo too! What an amazing finish. Congrats on finishing up the hand quilting and what a great way to finish with your grandma. Beautiful! What a good way to finish it! It looks fabulous, well done! it's just gorgeous. congrats! love that you handquilted it. Absolutely gorgeous. Your quilts always blow me away! Such an amazing finish Erica, and how nice that you were able to finish it off while spending time with family. Glad to hear you're home safe and sound. That's amazing Erica! Really big impact! what a totally amazingly stunning quilt. And how wonderful that you got to finish it while visiting with your family. That is so gorgeous and so inspiring! How special to finish your quilt with your grandma! Gorgeous quilt - well done. I love seeing this quilt every time you post it. 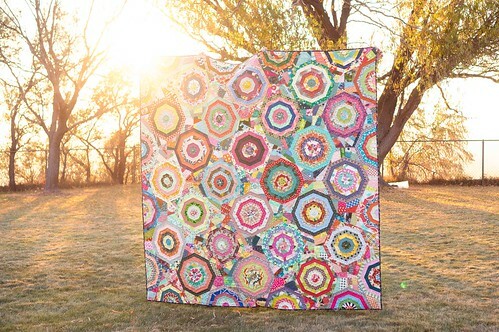 This is my dream quilt and one day I will make it. Maybe it will make it on next years goal list. Gorgeous quilt! It looks so antique! Well done. I think 9 months is pretty quick to finish that kind of project. Lovely to catch up with family. Definitely a strong family resemblance going on with the girls in your family! Such a beautiful accomplishment, congrats! What a special photo of the generations together. Hello! This quilt is simply stunning. Stunning! Well done! 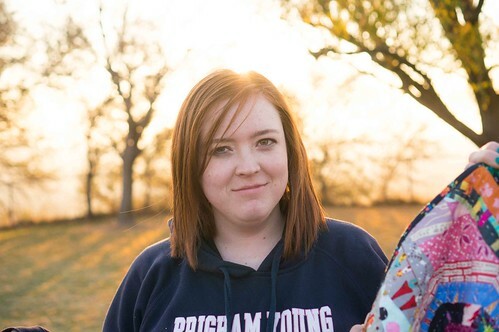 I just found your blog and am enjoying reading and looking at all of your beautiful work. 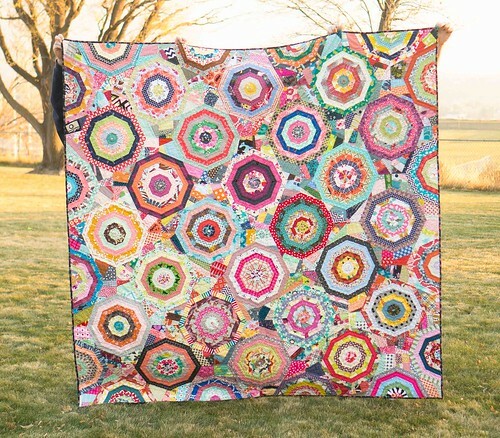 This quilt just knocks my socks off Erica! The perfect scrappy! I'm amazed at the thought of you doing hand quilting on it. Perle cotton must have added the extra special touch. It's also really fun to see the photo of four generations of women in your family standing together. I have a couple of photos like that and will treasure them always.